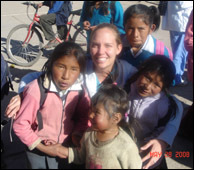 My trip to Peru in May, 2008 with the International Cervical Cancer Foundation was the most inspirational travel of my life. The purpose of the mission was to screen for and treat cervical cancer with PAP, VIA, colposcopy, and LEEP procedures in the underserved communities of Peru. We arrived at the small clinic in the rural town Pitumarca of the Andes Mountains on a large tourist bus on Monday morning, May 26th. It seemed strange to arrive this way as the women with their children on their backs were lined up outside the clinic, having walked for miles or even days. I was nervous, excited, and ready to get to work. The clinic had minimal equipment consisting of a stool and exam table in each room, and as we opened the supplies we brought with us, I already realized how little the small village had and how great of an impact we could have. The women, young and old, came into the clinic one by one with beautiful woven knapsacks, large hats, and eyes of hope, excitement, and quiet fear. We began examining patients, one-by -one and the days were over too soon. Each encounter brought a question, smile, or friendly gesture as they spoke the unfamiliar language of Cechua. The feeling I had was palpable throughout the clinic; a feeling few of us had ever known. We returned to the clinic for three days, with smiling faces and cheers as we came and left. The local people and mayor celebrated us with a closing ceremony of food, dance, music, laughter, and a key to the city for the INCCA founder. I then realized how much of an emotional and social impact they had on us in addition to the medical impact we had on them. We spent the last two days in Cusco in the newly constructed Cervicusco clinic, which now provides a permanent presence in Cusco to give continuous cervical cancer screening and medical care for Peruvian women. We provided care to over 1200 women and the clinic will continue to serve the thousands of women that were unable to come to the clinics during the week. Peru is the 30th country I have visited, and I have never left another destination more satisfied, fulfilled, overwhelmed, or reflective. I remember each face of the women I encountered in Peru and recall them often so I may be a better physician and person. The experience has left me with an overwhelming desire to pursue further medical missions so I might teach, learn, grow, and reflect through each encounter. What an exciting career to have that allows such an experience!